Clarence Henry Ralph Hancock was born at 20 Keppoch Street, Cardiff, Wales on 2 July 1893. The eldest of three brothers. Charles, born in 1896 and Edward (Ted) in 1905. The three brothers are pictured right. At the time of Ralph's birth, their father, Clarence Hancock Senior, worked as a clerk for a company known as Evans and Hughes who were Auctioneers and Estate Agents based at Borough Chambers, Wharton Street, Cardiff. The company was disolved in August 1899. One year later, Evans and Hancock was also disolved after only 9 months in business. Mr Evans had taken the decision to retire. The company was then taken over solely by Clarence Senior. He retained the name Evans and Hancock and continued to undertake work as Auctioneers, Estate and Insurance Agents and Accountants. 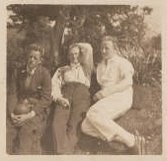 Clarence Senior is seen here (left) with his wife Clara and possibly their grandson, David (son of Charles)? We know very little of the early life of Ralph Hancock. We do have his Baptism Record and that he attended Roath Park School before joining the prestigious Howardian High School in 1905. The El Paso Herald-Post (Texas, USA) carried a news story in its 2nd Augst 1934 edition in which Ralph confirmed that he had been gardening since the age of 8 and that he had taken-over the family orchid greenhouse when he was 13. A few years after that story appeared Ralph admitted in Bankruptcy Court (Croydon) that, since 1921 he had held several positions as a gardener. As Ralph moves into adulthood more detailed records of his life and work become readily available. The Cardiff Directory of 1914, show's Ralph as being the Assistant Secretary to the Cardiff and Penarth branch of the Royal National Life-boat Institution. There is also a later record, from the same directory, for a company of Shipbrokers called Martin and Hancock, based at 39 St James Street, Cardiff. This is very likely to have been an enterprise between Ralph and a Mr (?) Martin as we do know that in 1917 Ralph's occupation was listed as a Marine and General Insurance Broker, based at 37 St James Street. On 5 August 1914, Ralph enlisted in the 2nd Welsh Brigade of the Royal Field Artillery. Click to see details of military service. His enlistment papers show him working as an Accountant for his fathers firm. On 19 December 1915 he was promoted from the rank of Private to that of 2nd Lieutenant. But, by 25 September 1916 he had been invalided out of the regiment and had been awarded a Silver War Badge. Records indicate that Ralph had undergone major surgery and was deemed unfit. On September 17th 1917, the now 24 year old Ralph married 21 year old* Hilda Muriel Ellis (known as Muriel) at All Saints Church, Penarth. An announcement of their wedding was published in the Western Mail on Tuedsay September 18th 1917. * In reality, Muriel was only 19 at the time of her marriage and, despite the fact that she came from a strict family, she eloped with her dashing young artillery officer. Muriel was born in Edmonton, London and at the time of her marriage to Ralph was listed as living in Letchworth, Hertfordshire. Records indicate that her father, Harold Bramley Ellis was a manufacturer of Mantles and Costumes with offices in Wilson Street, London EC. There he traded as Ellis, Hallen and Ellis. This 1911 Census Record reveals where the Ellis family were living at the time. Ralph and Muriel's first son, Clarence Neville Bramley Hancock (Bramley), was born in 1918. He was followed by a second son, Denys Hallen, also born in Penarth, in 1920. Records show that at the time of Bramley's birth, Ralph’s occupation was listed as a Marine and General Insurance Broker working from James Street, Cardiff. What prompted his career change is unknown. We do know that he was made bankrupt in September 1921 and that this may have been a factor in a change of career. We also know that Ralph left Wales and arrived in Shapwick, Somerset in the early 1920's. How Hancock started his illustrious career can be found here. We also know that In 1926 Ralph paid his two guinea membership fee and became a Fellow of the Royal Horticultural Society. In 1925, Ralph and his family moved to 'Letchworth', Downside Road, Sutton, Surrey, England and in 1928 a daughter, Sheila Muriel was born. It was from here in 1926/7 that Ralph undertook the ﬁrst of his more famous garden projects, designing and constructing a rock and water garden and also an Iris garden for H.R.H Princess Victoria at her home “Coppins” in Iver, Buckinghamshire. (Seen left are Ralph with sons, Bramley and Denys). Ralph was reportedly extremely proud of the garden. Princess Victoria was pleased enough that she presented Ralph with “a little diamond and sapphire tie pin”, one of his most treasured possessions. Newspaper reports of 1926 and 1927 describe the garden as having a lawn second only to that of the Centre Court at Wimbledon. The reports also tell how the Princess spends a good deal of time in her gardens. And, that she has personally directed their layout, on which she has some original and distinctly artistic ideas. The princess is also described as a keen hobbyist gardener. Ralph's main inﬂuences were William Robinson and Gertrude Jekyll. Ralph incorporated their "arts and crafts movement" style into his early designs. (Right, the rock, water and iris garden, which Ralph built for H.R.H. Princess Victoria). This image, taken from the 1935 edition of 'When I Make a Garden', was signed by the Princess who can be seen standing on the rustic bridge in the middle of this picture.